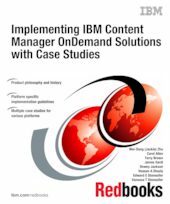 This IBM Redbooks publication will help you implement an IBM Content Manager OnDemand solution from the beginning to the end. We discuss the various stages of the Content Manager OnDemand solution implementation, including planning, software installation and configuration, design, application setup and verification, functional testing, performance testing, training, and finally deployment into production. The book is intended to provide end-to-end implementation guidelines to audiences who already have general Content Manager OnDemand product knowledge. To really help you understand the implementation process, we provide case studies drawn from real-life implementations. We cover all platforms of the Content Manager OnDemand products, which include Multiplatforms, i5/OS, and z/OS.